Thanksgiving is a favorite holiday for many as it brings family and friends together to remind them of the things that mean so much to them. While it's easy to have fun just by relaxing with loved ones and eating delicious food, playing games can also be a great festive addition to the day. If you're the host, it can also make your life easier by giving your guests (including the little ones!) something to do while you finish up cooking and setting the table. Turkey Hunt is inspired by the ever popular egg hunts of Easter. Each child receives a card that features 12 turkeys (each having a number 1-12). The 12 turkeys are hidden throughout the house and the first player to find all 12 turkeys wins! We recommend this game once all the children have arrived before dinner or if the adults would like to relax, it's a great option to play after dinner - just remind the kids there are no turkeys hidden where the adults are relaxing! This is an active game and makes for a great pre-meal activity. You will need a gourd or pumpkin and two brooms, and we recommend setting things up outside or in a large open area. Set up two players (each with a stick though children may be better off using their hands) next to each other. The goal is to use the stick to push the gourd or pumpkin to the finish line however far away you decide. This can also be done in teams. Roll the Gourd is a great way to get folks outside to burn off some energy before dinner. 3. Guess Who is Thankful? This game requires easy guest participation. When guests arrive, ask them to write on a piece of paper what they are thankful for this year. After the meal when everyone is relaxing, folks can take turns reading each piece of paper and guessing who wrote it. We recommend letting guests know about the game as they arrive as it will encourage a little more creativity then the more simple answers to this often asked question. Another take? Use the answers for charades! After the game of Roll the Gourd, hollow out the pumpkin or gourd and play a game of pumpkin golf. Players must try to hit a golf ball into the pumpkin. This is a fantastic game for the competitive folks in your family! Don't want to hollow the pumpkin out? Use the stem or whole pumpkin for an easy game of ring toss. Have extra large pumpkins? Use hula hoops! We recommend playing this game outside to avoid any mishaps indoors. 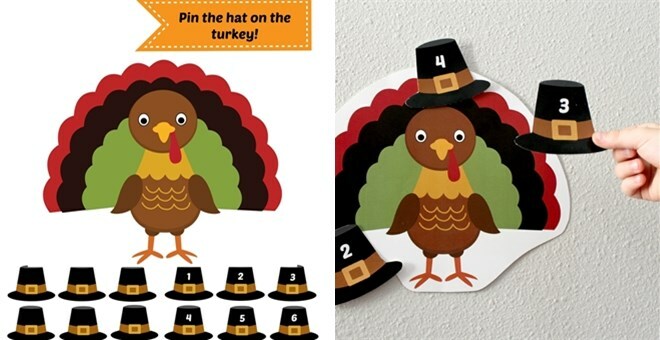 Play a fun Thanksgiving theme take on the classic game of "Pin the Tail on the Donkey." You'll just need a large piece of paper to feature the target and then as many small pieces of paper to act as the item being pinned. We recommend using tape to avoid sticking anyone with pins. Have any classic games that you play each Thanksgiving in your home? Please share in the comments.